This painting is a celebration and recognition of the determination of all those who suffered within the years under the horrendous tyrannical rule of General Nimieri who gained ultimate power through a military coup. 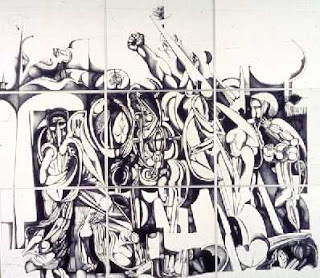 Never has there been a better time to show the world, "The Inevitable" by Ibrahim El Salahi. These nine panels of artwork are Africa’s, "Guernica", a testimony of war and revolution, which raises the global consciousness about the imminent threat of dictatorship and civil unrest. From it’s creation, "The Inevitable", has been housed in its temporary home at the Herbert F. Johnson Museum of Art in Ithaca, NY, though it makes frequent trips abroad the one place it never goes is the Sudan. Ibrahim has always maintained that the Sudanese people should own the 9-panelled Masterpiece, yet he refuses to allow the painting to travel to the Sudan until the country enjoys, public liberties and democratic institutions. Speculations as to the exact meaning of the anguished images are as numerous and diverse as the people who have viewed the panels. "The Inevitable", challenges the notion of warfare and depicts the chaotic, exposing the brutal acts of destruction and genocide. It is a testimony of Ibrahim’s art that the symbols chosen hold many, often paradoxical meanings yet the meticulous significance of the imagery remains ambiguous. Never before has an African artist made such a social statement, which has echoed the sentiments of an entire Nation and is as relevant today as it was in 1984/85. The panels are extremely powerful with determined lines. The western distinction between painting and drawing is irrelevant and as Ibrahim says: "There is no painting without drawing and no form without lines... in effect all pictures can be reduced to lines." 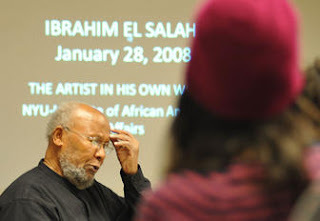 More about the phenomenal man, the artist, Ibrahim El Salahi.